Veverská Bítýška is a town in Brno-Country District in the South Moravian Region of the Czech Republic. The town covers an area of 13.65 square kilometres (5.27 sq mi), and has a population of 2,953 (as at 31 December 2008). Veverská Bítýška lies approximately 16 kilometres (10 mi) north-west of Brno and 171 km (106 mi) south-east of Prague. 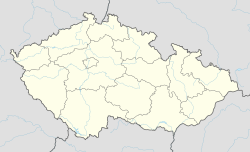 Previously a market town (městys), Veverská Bítýška has been given the town status effective 27 August 2018 by the Czech Parliament. Marie Kudeříková (1921 - 1943), a member of the Czech resistance to Nazi occupation, spent a part of her life in Veverská Bítýška. ^ Rozhodnutí předsedy Poslanecké sněmovny č. 15, k stanovení obce Veverská Bítýška městem, 27 August 2018. Wikimedia Commons has media related to Veverská Bítýška. This South Moravian Region location article is a stub. You can help Wikipedia by expanding it. This page was last edited on 6 September 2018, at 23:41 (UTC).